A new "C" Specialty license may be added to CSLB's list of classifications for the first time in 14 years. A public comment hearing regarding the proposed regulatory action for a C-22 Asbestos Abatement classification was held March 25 at CSLB's Sacramento headquarters. The proposal is scheduled to be reviewed during CSLB's quarterly Board meeting in April. Applicants for the C-22 license would have to satisfy experience and examination requirements, and C-22 licensees would be required to be registered by the Department of Industrial Relations' Division of Occupational Safety and Health (DOSH). 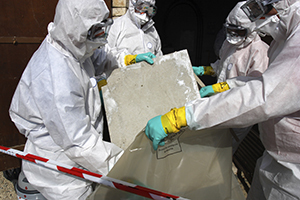 The new stand-alone asbestos abatement classification would not take the place of the existing CSLB asbestos certification requirements that is established in Business and Professions Code 7058.5. Contractors who perform asbestos work within their licensed trade(s) would not need to obtain a separate C-22 license if they hold the CSLB certification and are DOSH registered. Following Board action, the C-22 proposal will be reviewed by the Department of Consumer Affairs, CSLB's parent agency, and the state Office of Administrative Law. The new C-22 classification could become CSLB's 44th classification later this year. The last classification added was C-31 Construction Zone Traffic Control in 2000.